Ananka's Diary: On a Lighter Note . . . Apparently this awesome piece of street art is just a couple of blocks from my house! I'm on my way to check it out! 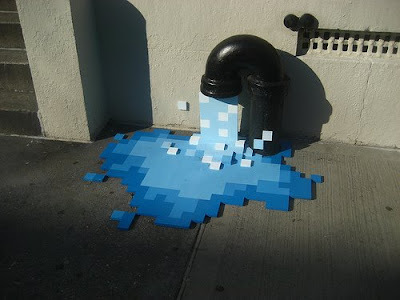 The photographer said it's on 9th Street west of 2nd Ave.
Woow.... at first I thought it was just a pipe that someone took a pic of and did little digi-things to online. I'm like, "So, she's going to go admire a black pipe?" Then i clicked the link and saw in detail. Ha! o mi gawd! thats totally rad. in wyoming theres no street art. =`( so sad and boring here... HELP ME!!! oh, haha never mind :) found the link... thats so cool!! hmmm... it looks like what international mastermind said... exept I clicked on the link and couldnt see a difference. what is it made of? Whoa! How did they DO that? Awesome! some people have such given talents - why can't I? I swear, I want to go to New York JUST to see all of the street art! um excuse me 9th between 2nd and 3rd? I believe that I live EXACTLY one block away from that location. how did i miss this??? is it still there and is it made of legos? Whoa, how did that person draw THAT!?!? Another NYer on the blog? where? what street? i'm a new yorker!!! i can get there FAST! Isn't that against Earth Day? I mean, water left running? Anyway... All you NYC-ers are so lucky!! I have street art here, but it's not that awesome. (I live in SF, people are more busy saving the planet, fighting for gay rights, and starting new religions to created street art-LOL, just kidding, SF has some fantastic street art, all of it is paintings though, no scultors. I think you should enter the page www.gatukonst.se if you like that. I'm sorry, the page is in Swedish, but you can always look at the pictures, right? How Much Would You Pay If You REALLY Had to Go?